The sun was shining on our second model railway auction of the year. There were 310 lots for keen bidders to choose from. In the real steam section this Accucraft Ltd gauge 1 LNER 4472 ‘Flying Scotsman’ 4-6-2 locomotive and tender realised £1,380. This Gauge 1 Model Co. (G1M) BR 70004 ‘William Shakespeare’ 4-6-2 locomotive and tender sold for £1,500. And this scratch built 3½ inch gauge GER ‘Petrolea’ Class 2-4-0 locomotive and tender achieved £960. 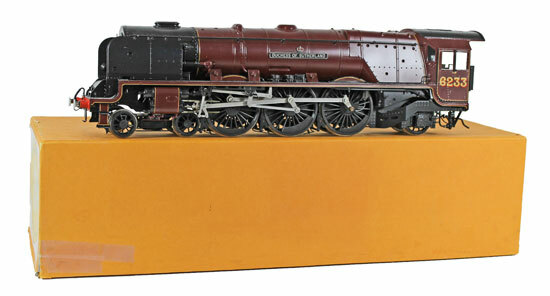 In the gauge 1 section highlights included this Finescale Brass RTR (Sancheng) LMS maroon 6233 ‘Duchess of Sutherland’ 4-6-2 locomotive and tender which realised £1,140. This Gauge 1 Model Co (G1M) BR Mk 1 rake of 4 coaches sold for £960. This Golden Age Models Pullman ‘Lucille’ coach No. 1 (A) achieved £630. And this sought-after Peter Rogers Models rake of LNER corridor coaches realised a massive £1,980! In the OO gauge section this Hornby Dublo BR Rebuilt ‘West Country’ Class 4-6-2 BR 34005 ‘Barnstaple’ No. 2235 locomotive and tender sold for £168. 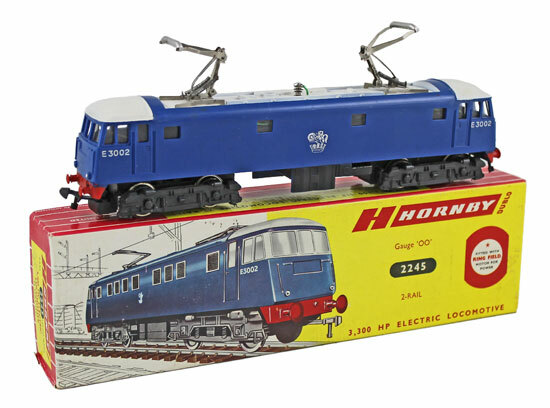 This Hornby Dublo 2-rail E3200 3,300 HP electric locomotive No. 2245 achieved £336. 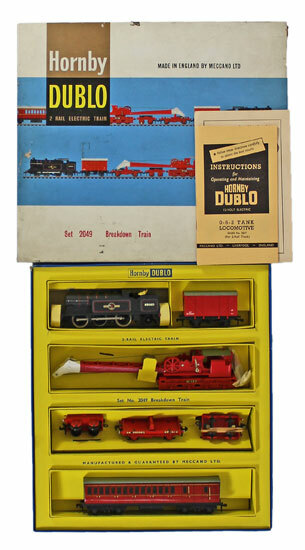 This Hornby Dublo Breakdown Train set No. 2049 realised £114. 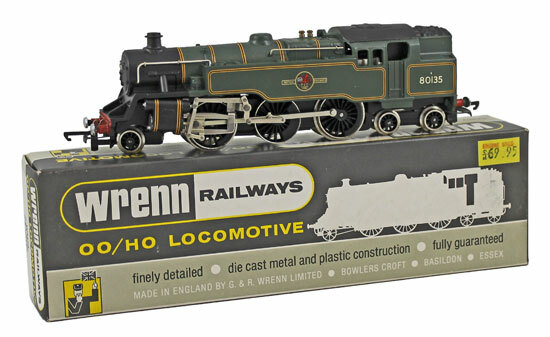 Our next Model Railway auction will be held on Wednesday 15th May 2019. The full catalogue for this sale will be on our website in the next few weeks or keep an eye on our Twitter and Facebook pages which will include updates of our latest auction news.